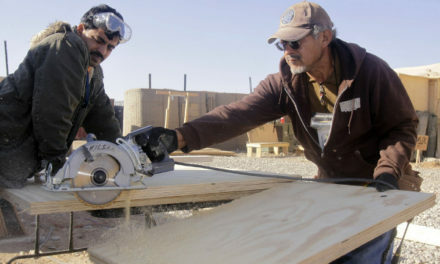 When I was growing up on construction sites in the late 90s, I sometimes felt like I had a circular saw permanently attached to the end of my arm. 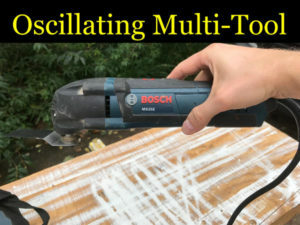 Whatever you call it though, the oscillating multi-tool is incredible because it carries out a function that no other saw manages so effectively: It lets you make plunge cuts directly into almost any surface you’ll find in a house. I really can’t overstate how much this saw has changed my operation as a carpenter. 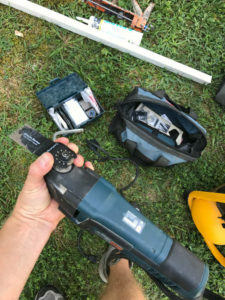 For a full rundown on the oscillating multi-tool and its various uses, read on below! 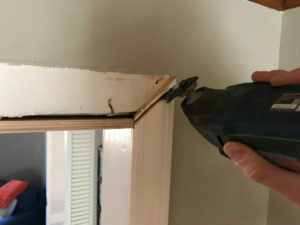 Before the invention of the oscillating multi-tool (by the Fein Tool company), it was virtually impossible to repair small, damaged sections of a house without first removing the components you wanted to alter. 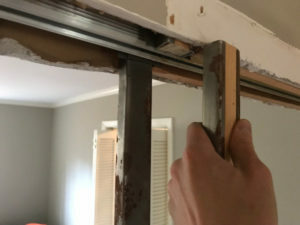 If you did want to attempt tricky plunge cuts, you had to choose between the CIRCULAR SAW, the RECIPROCATING SAW, and the jamb cutter—tools with too much power and limited surgical control. Unlike these predecessors, the oscillating tool doesn’t use a lot of force. And, it doesn’t spin or violently plunge. Instead, it simply vibrates. A narrow, flat blade mounts to a platen at the end of the tool. The motor slides this blade side to side in a ½” stroke at a blinding speed, causing the teeth to gradually notch their way into the material you’re cutting. When you extract the blade, you’re left with about a 2” X 1/16” slot, very precisely placed. The number of projects I use this tool for are getting too numerous to keep track of. But, there are several key operations that cause me to reach for it over and over again. I’ve made a short list of these frequent applications below, and I’ve also including a few tips on how to best handle the tool. By far, the most common use I have for the oscillating tool is extracting rotted trim. The control of the saw practically lets you perform surgery on exterior casings. 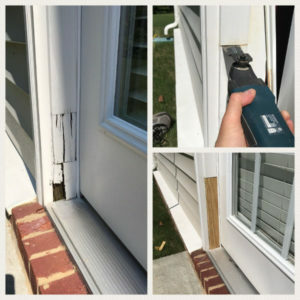 Window trim and door jambs are the common beneficiaries of this operation. 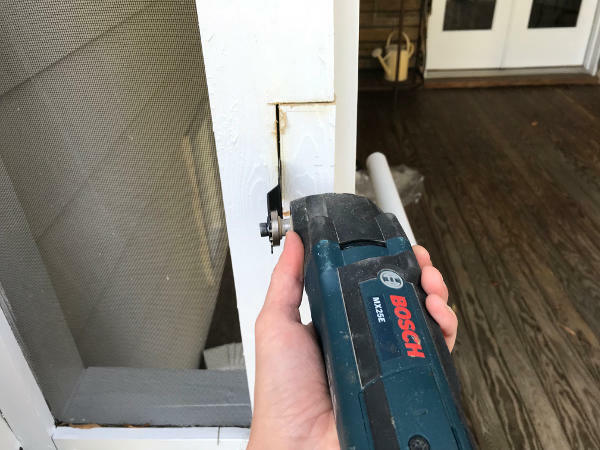 The saw cuts so finely that new, square-cut pieces splice in with only about a 1/16” gap (which is easy to caulk and hide afterwards). Using the saw for repairs like this is fairly simple. 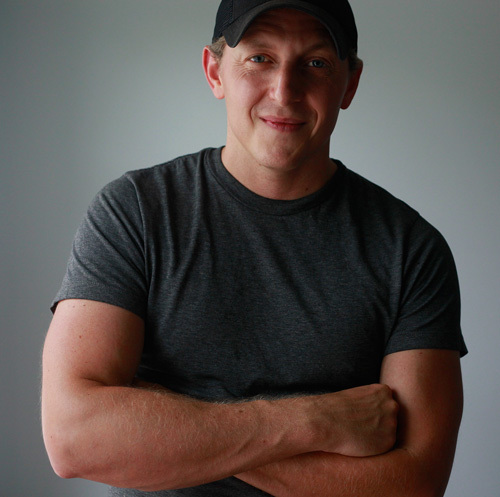 But, it depends largely on first laying out clean “plot lines,” or visual representations of the cut you’re about to make. With a clear plot line drawn, I install a designated wood blade in the saw (there are a variety of blades, which I’ll discuss later), then hit the power switch and approach the plot line slowly. I like to hold the saw sort of like a telescope (or sometimes, like below, with an overhand grip), gently pressing the vibrating blade into the surface of the wood and sweeping it side to side through the plot line in a flat motion. I always make sure the saw is perpendicular to the wall, or even angled upward ever so slightly. The constant sweeping motion helps to clear sawdust out of the cut, and thereby prevent the blade from binding up. Even so, friction against the blade is intense. Smoke sometimes issues from the cut line. If this happens, I just back the saw out and let things cool down for a second. Given that most trim is only about 1” thick, I’ll punch through the back of the piece in about 15-30 seconds. 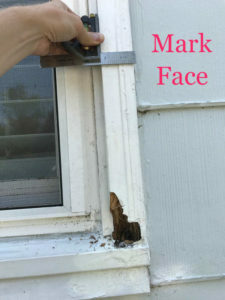 If I’ve gouged the trim or siding around the area a little, I easily fix these spots with a little caulk. With the trim severed, I can begin carefully removing the rotted portion, and getting a replacement ready. The second-most common use I have for the oscillating tool is efficiently cutting metal surfaces. Using the oscillating tool to cut metal just requires switching out a blade. Metal-cutting blades for the tool have smaller, more numerous teeth, which “file” through metal. The saw is not meant to cut through heavy metal, like thick steel. But, it can handle light-gauge steel and aluminum, like the studs in the pocket wall pictured above. The oscillating tool is also very good for cutting out embedded nails. 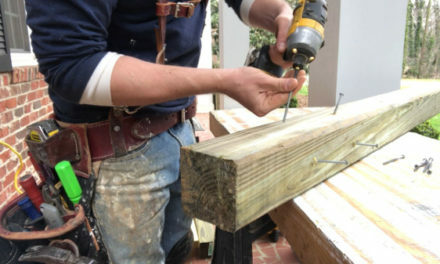 Typically, you can just “notch” the nail at its base, then break it off with a hammer, or even your fingers. Every now and then I need to cut material in a small nook or crevice. In these cases, the oscillating tool is pretty much the only tool that will work. The small, cylindrical body lets you hold it more or less like a flashlight while you direct it forward into a tight spot. 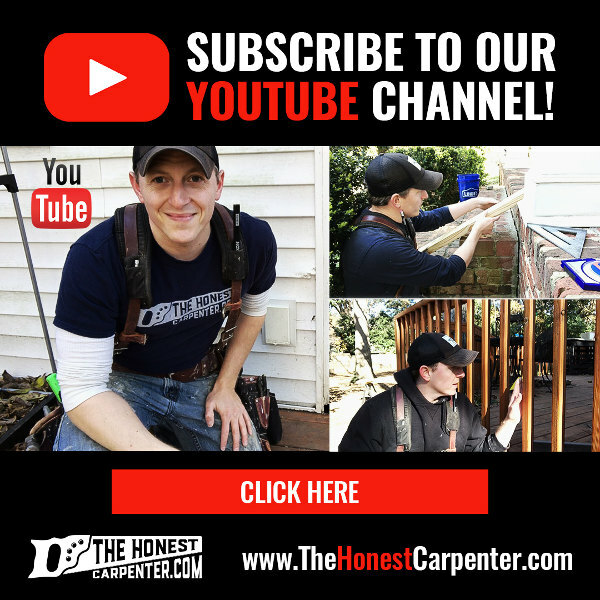 In these situations, the saw is a little harder to control. The blade will tend to wander. 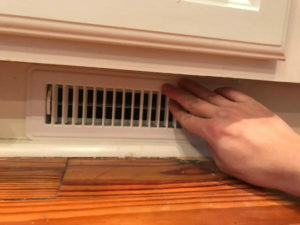 And, the vibrations can cause it to slip out of your hand if you’re not careful. Slow, steady progress, and a good place to rest your arm, make the operation safer. 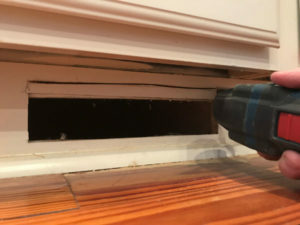 In the project pictured above, I used the saw to enlarge a baseboard utility opening in order to fit a new air vent grill. It only took about ten minutes, and the vent flange hides any irregularities. Sometimes, when I’m changing doorways or pass-through openings, I’ll need to adjust the overall size of the doorway. 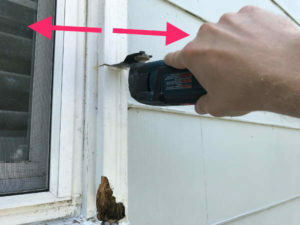 This necessarily means that the trim needs to be adjusted too. 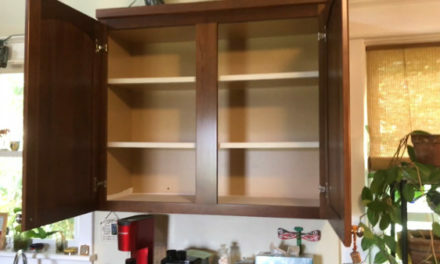 It used to be the case that I would have to carefully remove the entire trim piece, take it outside, cut it on the MITER SAW, bring it back in an reattach it. 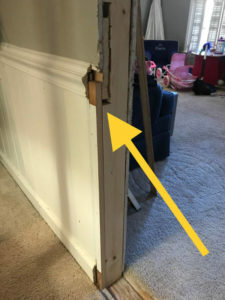 In that process, I would risk making minor cosmetic damages to the wall, the jamb, and the casing itself (not to mention create new nail holes and caulk lines to deal with). Now, with the oscillating tool, I scribe a new 45° with my speed square, stand on a stool, and just make the new cut on the wall. I wouldn’t do this on stained door casings. 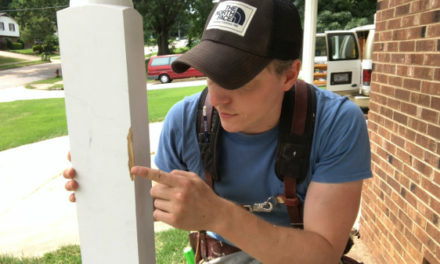 But, the saw is accurate enough to use on paint-grade casings where caulk can hide imperfections. 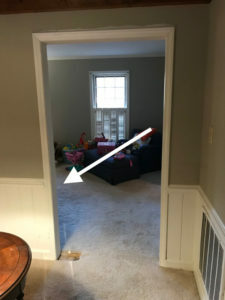 Similarly, when I’m installing built-ins or inserting new trim around a room, I’ll often need to “interrupt”—or cut back—existing trim to make space for what I’m adding. After I’ve carefully plotted the location of my new built-in or opening, I just anticipate the exact place where my old trim needs to stop, then scribe and cut the spot ahead of time with the oscillating tool. This takes some pretty careful planning. You have to factor in the width of your casing, possible “reveals” (an architectural detail around doors), and wiggle room for caulk lines. 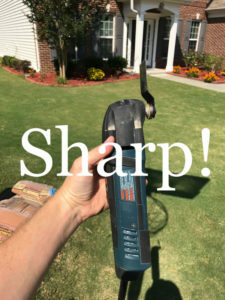 If you lay out your cuts carefully, though, the oscillating tool does in seconds what would formerly take hours of demolition, careful cutting, reassembly, and painting. I have used all of these attachments, and they all do have their benefits. But, nothing outweighs the use of this tool as a simple saw. Far more important to me is the variety of blade attachments. 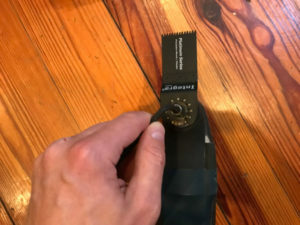 Metals, plastics, hardwoods, softwoods, and nail-embedded woods all have specific blades, with different tooth designs, for use in the oscillating multi-tool. I cycle through them routinely on the job site. 1. It is deceptively easy to hurt yourself with this tool. 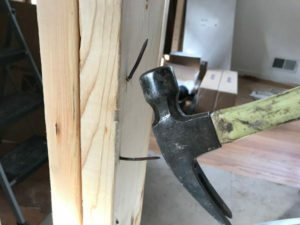 It is also easy to hurt your house with this tool. The blade on a oscillating tool is fully exposed, with no guard of any kind, and the blades are wickedly sharp. If dropped, it will gouge your nice floors. If dropped on your foot, it will chew through a boot, flesh, and bone with ease. So, be careful! The strong vibrations also have a way of lulling your hand to sleep. And the cylindrical body makes it tempting to hold it in casual, insecure ways. Fight this instinct. Always keep a firm, reliable grip on the tool, and avoid passing it between hands a lot. If you do exchange it between hands, get your other limbs out of the way. Really, it’s always best to keep both hands on it at all times. Also, don’t set it down while it’s operating. It’ll jitter and tumble around. Turn it off, wait for it to wind down, then set it somewhere nearby, preferably on a box or rug. 2. It makes an unholy racket. This is seriously one of the loudest tools I own. Despite it’s size, the saw’s motor is quite strong, and it operates at incredible speeds. When turned on, the oscillating tool produces a whine that is highly annoying. But when it is pressed into wood, that whine becomes a migraine-inducing shriek that will ring in your ears for hours afterwards. Cutting metal is even worse. 3. Blades and bits are expensive—and they wear down quickly. Like many tools, this one becomes almost useless when the blade is dull. It will bind up in wood quickly, and cuts will take an eternity to finish. Unfortunately, the blades don’t last too long before they become blunted. On bigger jobs, I’ll sometimes burn out a new blade in a single day. The good news is that a slew of GENERIC BRAND, AFTER-MARKET BLADES have begun to show up online. As long as you know the make and model of your tool, you can purchase blades by the dozen for a fraction of the name brand prices! That’s pretty much it. 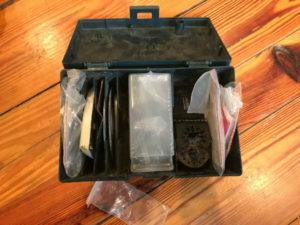 If you’re someone who likes to tackle a lot of repairs on your own, I really can’t recommend a better tool than this one. So, shop around, check reviews, find the model and brand that’s best for your budget and needs. But, seriously, think about getting one for yourself. And if you do, always practice safety precautions when using it!